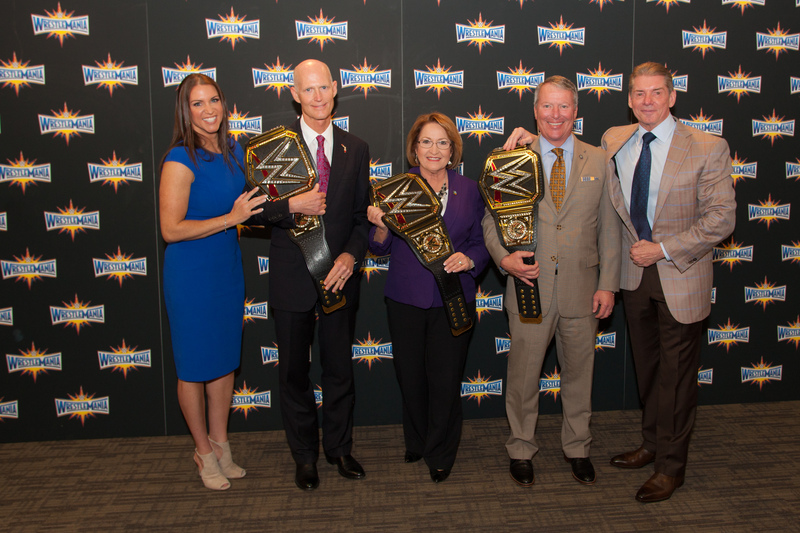 Mayor Jacobs was joined by Florida Governor Rick Scott, Orlando Mayor Buddy Dyer, the Central Florida Sports Commission and the leadership of the WWE, an integrated media organization and recognized leader in global entertainment. WrestleMania is more than just a one-day event; it’s a week-long celebration that will stretch throughout Orange County. In addition to WrestleMania, other activities will include: WrestleMania Axxess – WWE’s four-day interactive fan festival at the Orange County Convention Center; the 2017 WWE Hall of Fame Induction Ceremony at the Amway Center; Monday Night Raw® at the Amway Center; Be a STAR® anti-bullying rallies; hospital visits, and other community outreach initiatives designed to give back to the host community. The event will be broadcast live on WWE Network and pay-per-view in more than 180 countries. The Citrus Bowl previously hosted 75,000 fans for Wrestlemania in 2008. For four consecutive years, WrestleMania has generated more than $100 million in economic impact for its host region. This year, WrestleMania 32 takes place Sunday, April 3, at AT&T Stadium in Arlington, Texas. In 2013, Orange County also welcomed the WWE’S state-of-the-art Global Performance and Training Center. The 26,000-square-foot facility has seven training rings, a world-class strength and conditioning program, and cutting-edge editing and production facilities, giving WWE the ability to train more potential performers than ever before through a comprehensive program, including in-ring training, physical preparedness, and character development. Full Sail University also produces the WWE’s live “NXT” TV show every month. Over the past three years, NXT has awarded $250,000 in scholarships to the students at Full Saul University. View photos from the announcement on Mayor Jacobs’ Flickr album.